And 3 lucky winners stand a chance to win eBook copies of the book. Keep reading to find out how you can be one of the Lucky Winners. All you need to do is head on over to the book page (http://www.packtpub.com/learning-dhtmlx-suite-ui/book)and look through the product description of the book and drop a line via the comments below this post to let us know what interests you the most about this book. It’s that simple !!! The contest will close on Jan 15th! 3 best comments will be selected as Winners by me and will be contacted via email by Packt publishing, so be sure to use your real email address !! 7 Responses to "Free eBook Giveaway"
Great job on the book! I think I would be most interested in the JSON for grids and charts as I mainly work with JS and depend on AJAX GET requests of JSON data. This mainly entails requesting data to generate statistics, graphs, tables and other visualizations. Your book seems very well structured and should be helpful for many people who are looking to work with widgets and other standardized gui interface objects. Hope it does well! 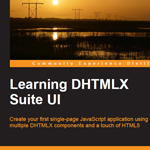 How fortunate am I to have happened across such a complete book on the DHTLMX toolkit that covers the most required aspects of building modern application interfaces?! Well-written, concise, and logically written, Learning DHTMLX Suite UI covers this powerful library, soup-to-nuts, and I can’t wait to read it cover-to-cover to immediately deploy these powerful UI tools, such as DHTMLX Windows; rapidly deploy DHTMLX Charts, and build a DHTMLX File Commander/Explorer backend admin for a client site. Finally! a book about DHTMLX suite, Thanks a lot! Hey Eli, a follow up to this great technology and your forthcoming book. Currently I’ve taken over the development of a product that uses DHTMLX controls. I’m much more familiar with tools from other vendors ie: ComponentOne, infragistics, Telerik & DevExpress. I need to make a decision of continuing to use these components & perhaps using them better. vs replacing them. I’m interested in reading your book to evaluate the potential of this library. It may be faster than scanning the product documentation.